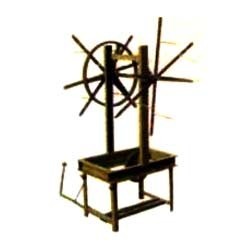 We are the prominent manufacturer and supplier of Hand Coir Winding Machines. This machine is manufactured using finest quality raw material that is tested on various quality parameters that insure the quality of the offered machine. Known for user friendly interface, reliable operation, high production, sturdy construction and compact design, this machine is used in winding the applications of various kinds of coils. Further, we provide this machine at industry leading prices to our valued clients. Leveraging on the industry acquaintance and expertise of our team of professionals, we have become the remarkable manufacturer and supplier of technologically advanced range of Coir Yarns Spinning & Coir Machinery. This range includes Coir Yarns Spinning Machines, Coir Pith Processing Machines, Automatic Feeding Machines, Coir Curling Machines and many more. The entire range of machines offered by us is designed and developed using the best quality components in adherence to the predefined industry quality standards. These machines are highly acclaimed for their longer service life, resistance to corrosion and efficient functionality. We stringently pursue quality control policies at each stage of our production process, which results in the fabrication of perfect and fault free machines. Also, we are associated with authentic and the most reliable vendors of the industry for procuring the excellent quality raw material for the manufacturing process. Our well-resourced infrastructure enables us to undertake voluminous orders of the clients at rapid production rate.